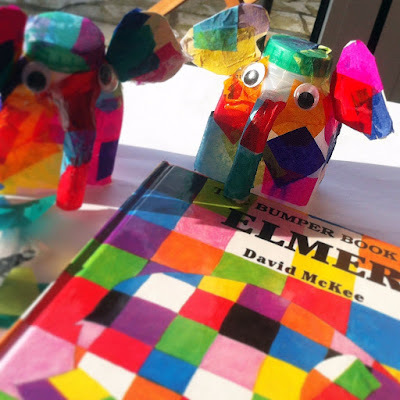 During my search for simple, diverse books for little ones, Elmer by David McKee was recommended to me. We are familiar with the character from a small set of board books we own but, I confess I had not read the full Elmer story for many years. So last week I decided to dig out my brother’s Bumper Elmer Collection and read it to the Mini Reviewers. We found Elmer to be a fantastic book to explore the concept of diversity together. The story itself is about a brightly coloured patchwork elephant, who loves a good joke. He thinks the other elephants find him funny because he is different, so in an attempt to blend in with all the other “elephant-coloured” elephants, he paints himself with berry juice. Elmer soon realises that being different may actually be a good thing. When the rain washes away his disguise and his true colours are revealed, the other elephants reassure him that they love him just the way he is. Declaring the day “Elmer Day”, they plan to paint themselves multicoloured once a year in his honour. This really is a classic children’s book, which has truly stood the test of time. 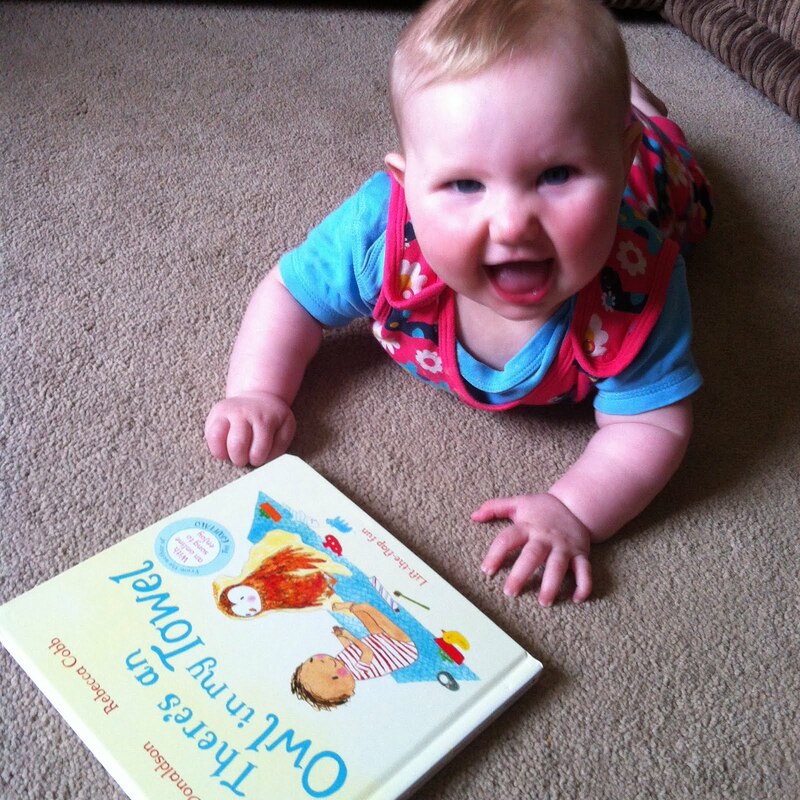 Filled with humour and colourful illustrations, the book is very appealing to young children. Elmer himself is such a memorable and lovable character but most importantly the book imparts the vital message - just be yourself! Inspired by a craft tutorial for “Elmer Lanterns” on “Sun Hats and Wellie Boots”, we have made our own recycled Elmers. 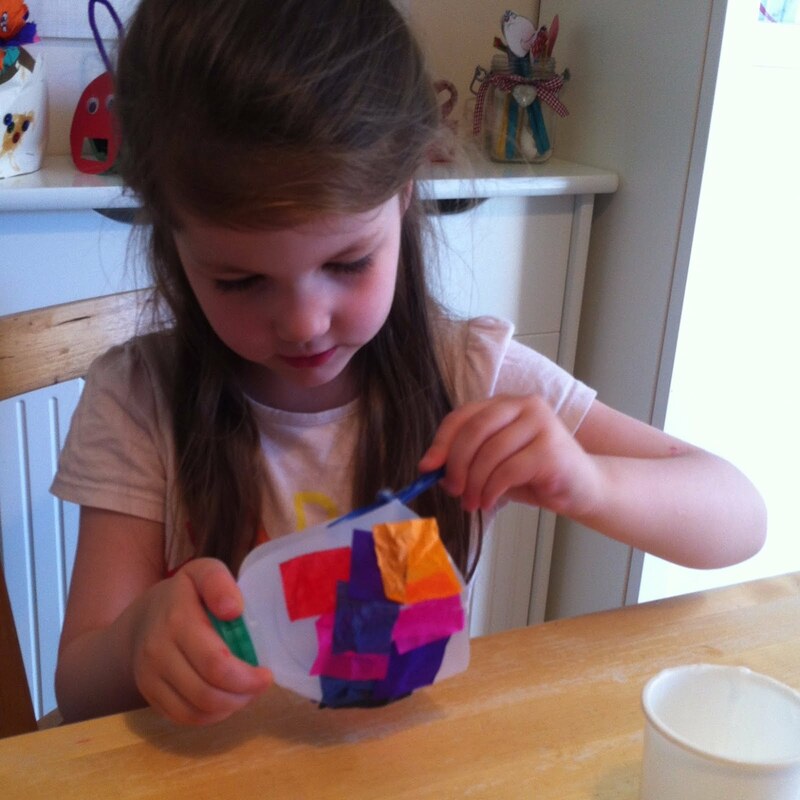 They were extremely simple to make and have been a huge hit with the children. For each elephant we used an empty plastic milk carton; lots of small squares of colourful tissue paper (mostly old packaging); two googly eyes; PVA glue; two small pieces of cardboard; and a hot glue gun. 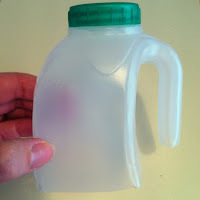 To make each Elmer I started by cutting the milk carton. I just cut it straight across as I wanted it to be as easy as possible for the children to hold to decorate it. 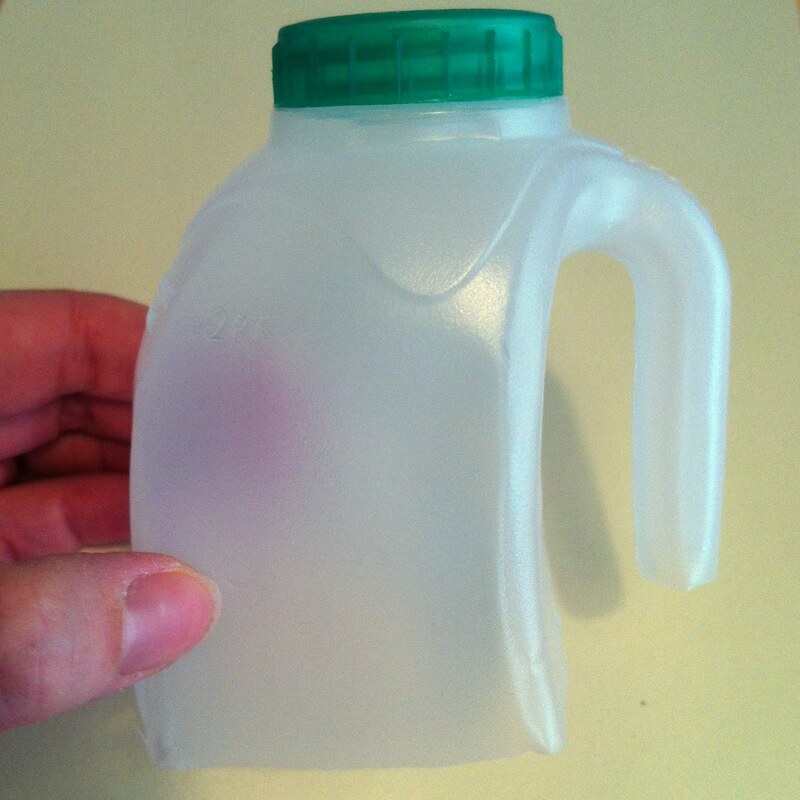 It is possible to cut legs and even a tail shape into the carton (see the original tutorial). I then cut the handle slightly shorter to make the trunk. Next the children set to work covering their carton in watered down PVA glue using old paint brushes. They stuck the small squares of colourful paper all over their cartons. Then they applied more of the glue mixture over the tissue paper. This got fairly messy but nothing a baby wipe or two couldn’t solve! We decided that our elephants needed ears, so I cut ear shapes out of thin cardboard, the children then decorated these with more tissue paper. We left everything to dry for a few hours before attaching the googly eyes and ears to the plastic carton using the hot glue gun. (I had wanted to use PVA glue for this but it wasn’t adhesive enough). We were delighted with our finished Elmers. 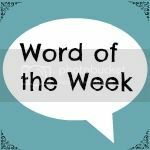 Word of the Week: Puddles! Well, this week I’ve bitten the bullet, or rather we’ve bitten the bullet and Theo has started potty training. While Izzie took to the potty with ease, I have suspected for quite some time it would be more of a struggle for Theo. Izzie never liked having a wet or dirty nappy, so from the stage she could sit up, we used to hold her on the potty. Then she would sit on the potty herself each evening (in front of CBeebies of course) and suddenly one day she started taking her nappies off and that was that, time for big girl pants. Her timing was dreadful as I was about 8 months pregnant with Theo and I really didn’t want to keep bending down to clean up little accidents. But, as always, Izzie was determined and, by the time Theo was born, she was dry during the day. In contrast Theo has never liked the potty and hates having his nappy changed. Even now it takes ninja-like skills to do a quick dirty/clean swap. He is usually thrashing around on the floor like a demented octopus. Or, even worse, stubbornly lying flat on his front, nose pressed to the ground, body as stiff as a board! When asked, he will deny his nappy is dirty. He chooses to sit in it (whatever the state) just so he can continue to play. Therefore, as you can imagine, potty training him was at the very bottom of my “to do” list. Anyway towards the middle of this week he took me completely by surprise and expressed an interest in wearing his “big boy” pants. 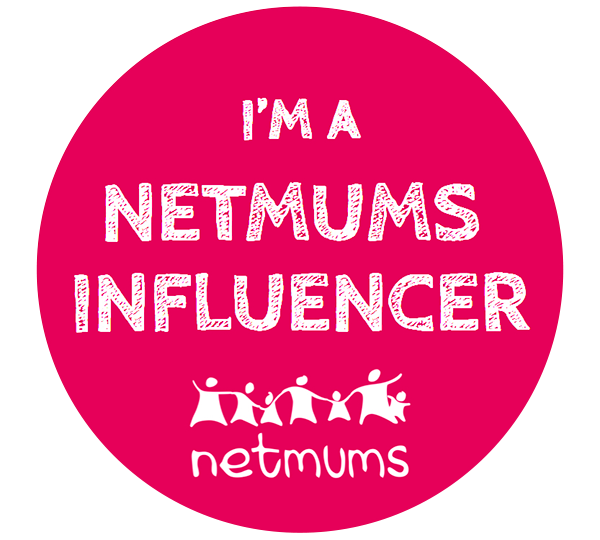 (Remembering just how many pairs I’d needed for Izzie, I had bought several packs in the Mothercare Christmas sale!) So on Thursday I got out the pants, the obligatory stickers and all the potty/pants related books I could find, and we began. Since then Theo has been running around the house in just pants and a top. His favourite potty has been travelling from room to room with us. I was not expecting this to be a quick process and I have been “cheating” and putting him in nappies for car journeys and at naptime to make it that bit easier for me. Day one there were lots of little puddles and even a wee in his favourite boat! But amazingly today there were just two puddles and six successful potty trips. Hooray! This may of course be beginners luck but I am just glad he will now happily sit on the potty. 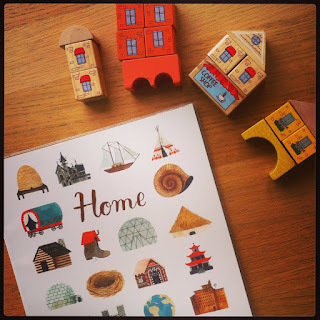 Having returned from a fantastic few days away, it felt like an appropriate time to review this beautiful picture book called “Home” by Carson Ellis. This book really is a work of art. From start to finish every page is exquisitely illustrated with a picture of a different home. From palaces to shoe homes and from sea homes to space homes. The book is packed full of unusual and imaginative illustrations providing so much to talk about. Our favourite thing about the book is you can connect many aspects of the pictures to the illustrations of the artist’s own home at the end. For example, the same tea cup and the same red stripey socks can be seen in several of the other images. We first read “Home” the week before we went away and on our return have re-read it again and again. 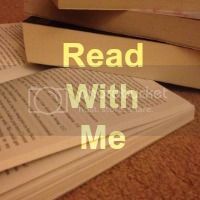 Each time we go back to the book, we seem to find new connections or things to talk about. I love the fact the same bird seems to be flying through the book, as if to unite us all. "Home" has truly inspired us to think about our own home, as well as the homes of others. We have discussed the similarities and the differences and the things that make each one special. The book also prompted a whole afternoon of creative play for Izzie. She drew her own home; made a fairy house out of Lego; and, with a little cutting help, she tried to re-create one of the pictures in the book. This is a book we will be very sad to return to the library. "Where is your home? Where are you?" "Home" to me personally is all about family rather than a place. I kiss them gently, holding them tight. From this home they’ll want to go. Watching them smile and dance and play. This week we have been on our summer hols, so of course I had to purchase the latest Pip and Posy book from Nosy Crow to take with us. 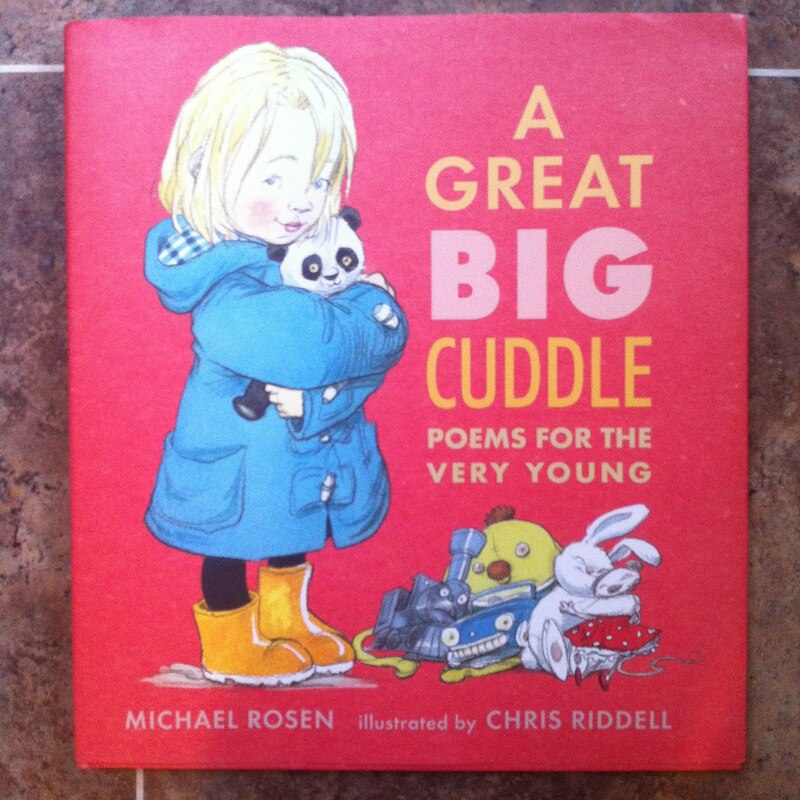 For those of you that have read some of our previous posts, you will know that we are big Pip and Posy fans. 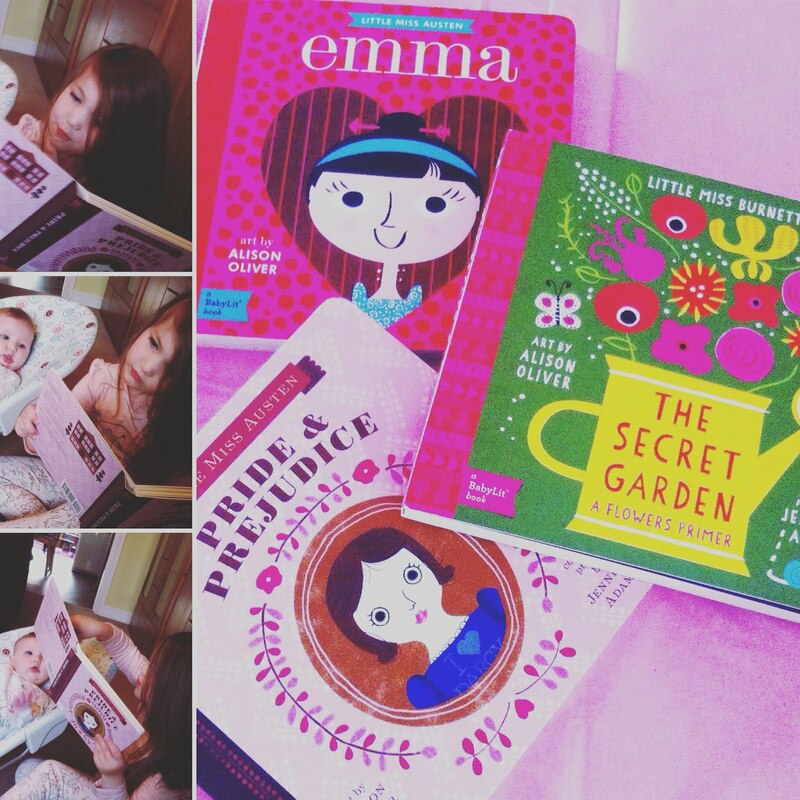 The new book “Pip and Posy: The New Friend”, is a great addition to the series. It is set at the seaside and introduces a new character, Zac. 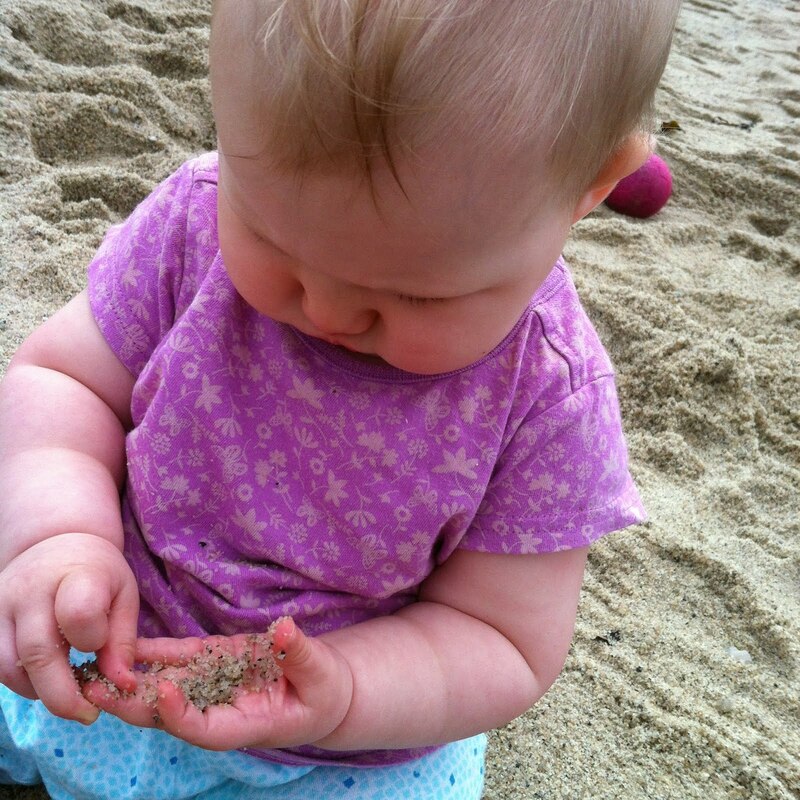 Pip and Posy are happily playing together at the beach, collecting shells, digging in the sand and paddling in the sea. When Posy takes a nap, Pip makes a new friend, Zac. Pip really enjoys his new games with Zac, however, when Posy wakes up, she is feeling rather left out and doesn’t want to join in. As with all these gentle books there is an important lesson to be learned. 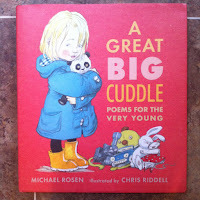 This makes Axel Scheffler’s series perfect for little ones. All three Mini Reviewers enjoyed the story, especially as it was so relevant to our traditional seaside holiday. I loved that Posy reminds Pip to wear his sun hat and is shown with her bottle of suncream. This even helped me persuade Theo to have his cream on! The illustrations are colourful and the characters are very expressive. The story itself is simple and short (I actually quite like this), however there is so much to talk about on every page. This is certainly one for your summer reading pile. 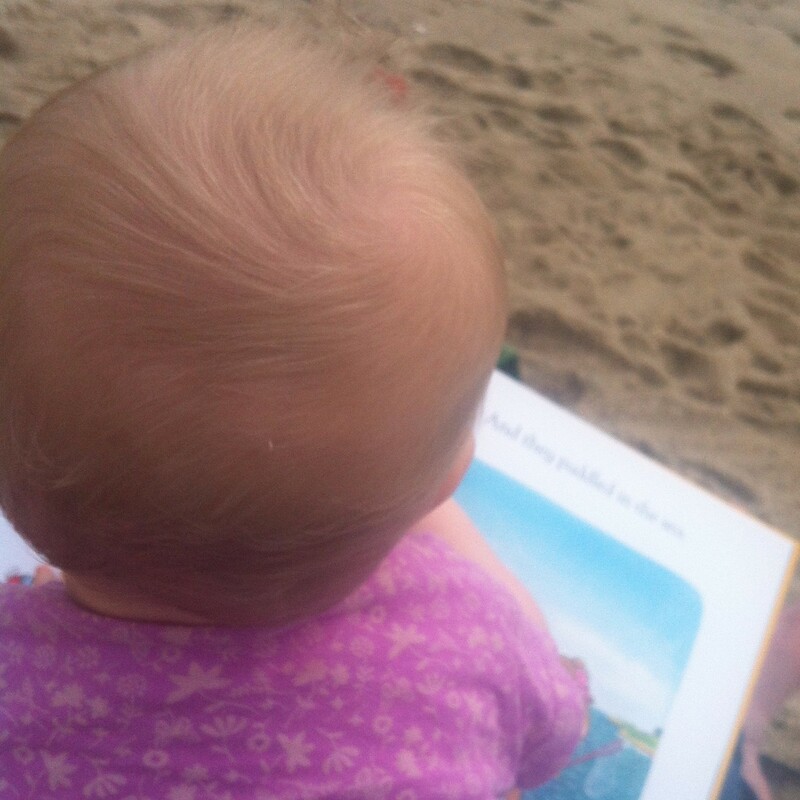 Poppy even enjoyed having a little read with me on the beach. She was also fascinated by the sand! Our Eden Project Visit - Three generations, a double buggy and an electric wheelchair! 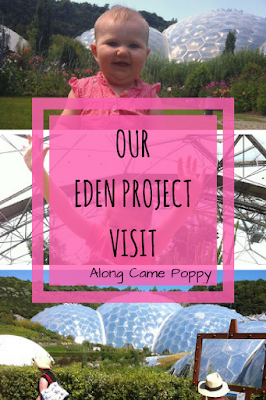 This week three generations of our family visited the Eden Project in Cornwall. We were hoping for a fantastic family day out with a difference. But with a double buggy, an electric wheelchair, four adults and three children under five, was there really something for everyone? And, just how did we cope with the heat on the hottest day of the year so far? We have been intending to visit the Eden Project as a family for an extremely long time and this week we finally got there. Hooray! Yorkshire to Cornwall (via Birmingham) is quite a drive, so we made a holiday of it, staying just outside St Austell. When we arrived at EP, it was already gearing up to be an incredibly hot day. With the heat in mind, we decided to make the hottest of the two Biomes (or bubbles as the children called them) our first stop. As we walked through the sweltering rainforest we spotted bananas, birds and waterfalls. Although the highest platform was shut due to the extreme heat, we still managed to get some fantastic views. We also saw the EP team chopping down a banana tree, which caused great excitement. There was so much to talk to the children about, despite most of the activity boards and educational displays being aimed at slightly older children. Had it not been so hot, we could have stayed in the rainforest for longer. There was a “cool room” about halfway round and we popped in there twice. We also had cool drinks for the children. In relation to accessibility, there was only one section we were advised not to go along with the buggy and wheelchair. We then had a pit stop for lunch in the Link before heading into the Mediterranean Biome. The atmosphere inside was much cooler and this biome was full of the amazing colours and smells of the Med. Again, there was so much to look at. The children spotted an array of different fruits growing. There were also lots of interesting sculptures. Imagine everything from driftwood pigs to giant metallic spiders. Theo even found a wooden tractor to drive. We stayed in the biome for Storytime and then ventured outside. Outside we meandered (very slowly) through the beautiful gardens. We stopped to have a good look at the giant bee and the huge man made out of discarded electrical goods. The children spent a long time exploring The Garden of Senses with its tactile walls, water features and xylophone. After a brief musical interlude from Theo, we continued on our way. Next we visited The Core, which Theo entered by slide! In there we stumbled upon an under 5s soft play area with dressing up costumes. It was a great place to cool down and the three children loved it. It was then time to go so we headed back to the Visitor Centre via the giant bridge. This provided brilliant views of the site and a closer view of those brave enough to use the overhead zipwire! Everyone had a fantastic day and we found there were plenty of things to keep us all entertained. 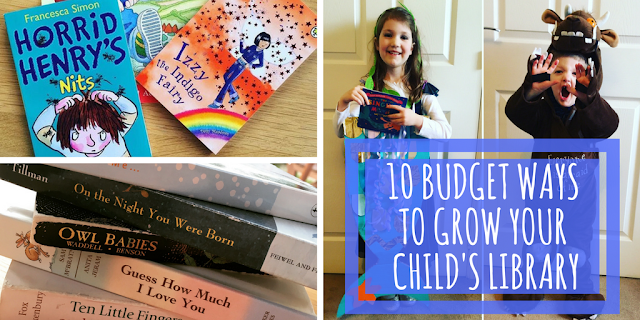 The highlights for the children included Storytime in the Med-Biome; Soft play in the Core (under 5s); and exploring The Garden of the Senses. We could easily spend another day at EP and hope to return with the children at the end of the week for the special Dinosaur Uprising Event (23rd July - 4th September). 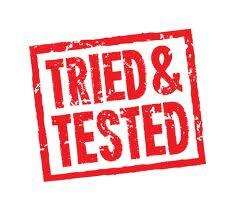 The site is very child friendly and accessibility was not an issue. All the staff were helpful and polite. There are lots of places to eat and drink as well as spots to picnic around the site. We ate in the Link between the two indoor Biomes. We can recommend the burritos, hot chicken platters and huge cakes. At first glance, the meals seem expensive but the portions were generous and the food was delicious! The kids had little food boxes with drinks, wraps and snack items. There are plenty of high chairs and space for the double buggy and electric wheelchair in the restaurant. There are many clean, accessible toilets and unisex baby change facilities around the site. There is a breastfeeding room, which I didn't visit but instead I took advantage of several of the many benches. There are several car parks and a shuttle bus service. We, however, parked in the disabled car park. Even from this car park, it was quite a walk to the Visitor Centre but wheelchairs are available if required. Electric wheelchairs can also be borrowed free of charge and these are collected from the Visitor Centre. We phoned in advance to book one for our visit. There were 7 in our party (2 adults, 2 over 60s and 3 children under 5). We purchased joint annual adult membership online prior to our visit. The membership costs £75 and allows unlimited access for two adults for the year plus a guest each. The children were free. This worked out to be £20 less than the cost of the standard admission prices on the day. See the official Eden Project website for further details regarding entry prices and concessions. +Look online to find the best ticket price for you before you visit. +If you need an electric wheelchair, phone and book one in advance. +Pick up a free map from the Visitor Centre. +Be prepared for the weather: Don’t forget hats, sunscreen and water if it’s hot. Waterproofs, if it’s wet. 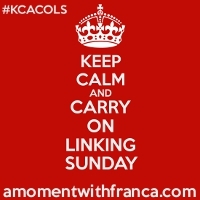 +Go with an open mind, take your time exploring and, most importantly, have a great time! Have you visited the Eden Project? Our word of the week is... Eden! This week Poppy started to crawl, I mean really crawl. I momentarily leave her in the lounge, she finds me in the kitchen. I pop her on the changing mat, turn to grab a nappy and she is under the bed. Nowhere is safe and she can literally squeeze into the smallest of spaces. Her favourite spot seems to be down the side of the TV. She obviously knows that is where all the good plugs and cables are! I am delighted that she is on the move (and so is she) but I am starting to realise we have a slight problem. Before Izzie could even roll over, the whole house was baby proof. Every socket had a cover and almost every cupboard a catch. Then Theo came along and due to his ninja moves and climbing skills, the coffee table gained padded edges. With Poppy, however, the other two children are the real "safety" issue. Theo wants to climb on her, or worse jump over her. Izzie wants to carry her like a doll. Plus the whole house is strewn with an array of inappropriate plastic toys and clutter. This week I have already removed the following from her mouth: a playmobil ski; Theo's shoe (on three separate occasions); tissue paper; an ipad; a plug (unplugged - twice); a clothes peg; Lightning McQueen; a little plastic man and a copy of Chemistry World! I read somewhere that the more children you have, the less you worry about the little stuff and I do think this is true. All I can hope is Poppy starts to walk very soon and learns to out run Izzie and Theo. Plus we need to work on keeping the clutter to a minimum. 366 Books in 366 Days: Izzie's Picture Book Pick! 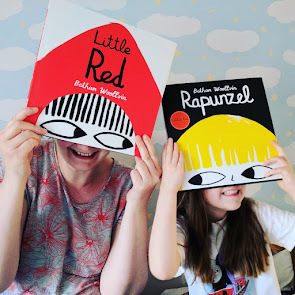 This week I asked, Mini Reviewer, Izzie (4), to choose five of her favourite picture books to share with you. After A LOT of consideration, here are her top five stories. I have to say, I wasn’t surprised in the slightest! Possibly one the most well known children’s books and a modern day classic, “We’re Going On A Bear Hunt”, is Izzie’s favourite book to chant out loud (sometimes very loud). 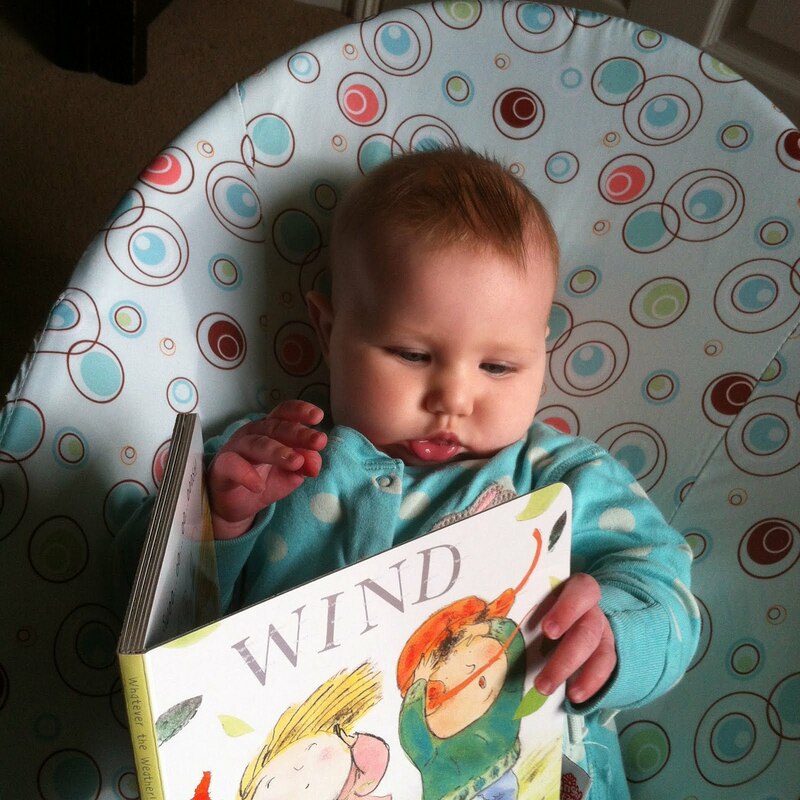 Full of repetition, the story promotes reading and is perfect for little ones to join in with. 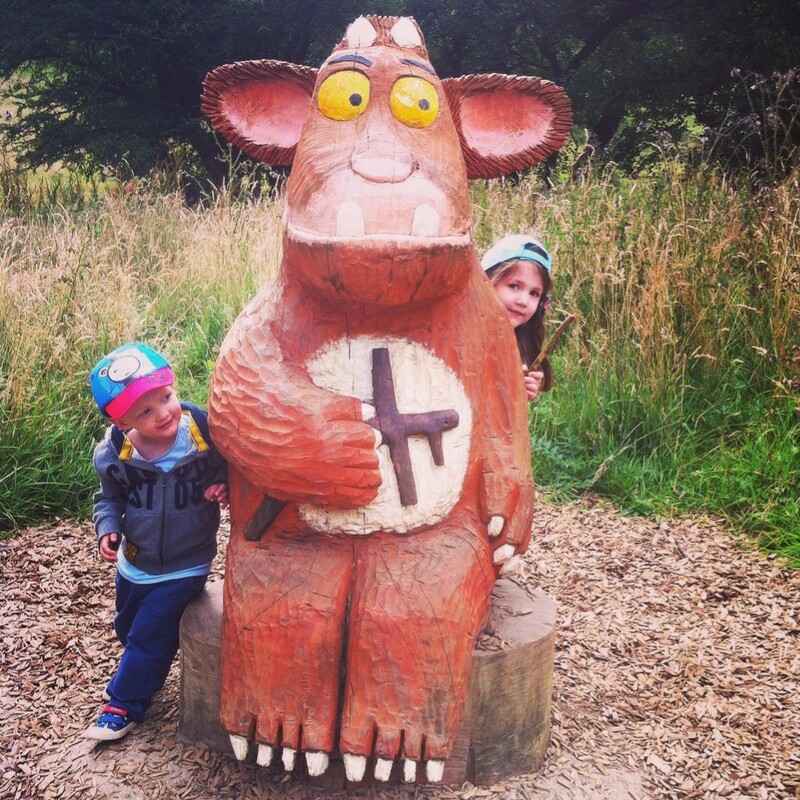 Join the family on their adventure across the countryside in search of a bear. We love doing the actions together as we pretend to go through the swishy grass, squelchy mud, deep river and the snowstorm. With its dramatic conclusion, this is a story that really makes both young and older imaginations run wild. One for every child’s bookshelf. A word of warning, the first time I read this to Izzie she was about two years old. I read it a little too enthusiastically and terrified her. We had to avoid the book for a few months! This is a completely new book to us and one of our current library book haul. Given the number of books we are reading at the moment, it is hard to find ones that truly stand out. Well this one does, the main characters, Ben and Bella are lost having been bumped off the page of their own book. The story follows the pair as they make their way through other, very different, books in attempt to get home. With puzzles to complete, differences to spot and even an origami boat to make along the way this is a unique and fun filled story. I'm so glad we discovered it. We just love Lydia Monks’ sparkly illustrations in this rhyming tale by Julia Donaldson. It is the story of mermaid who loves to sing. She is convinced by Sam Sly to leave her home and go and sing in the circus. But when things are not as Sam promised, the singing mermaid wants to go home, but how can she walk home with only a tail? If you enjoy this then why not try "Princess Mirror-Belle and the Dragon Pox" or "Sugarlump and the Unicorn". This is a fantastic interactive book. Just follow the instructions on each page and see what happens. Dots appear, disappear, move, change colour and size. All this is done with clever illustrations. The concept is simple, yet the books continues to amaze and delight the children each time we read it. I have to say, I’m pretty fascinated by it too! 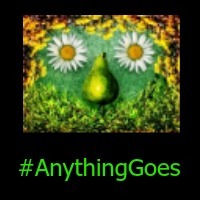 If you like this you may also like "Mix It Up" and "Let’s Play" also by Herve Tullet. Izzie’s final choice is this classic from the brilliant Judith Kerr about one little girl's extraordinary teatime visitor. Even though we have read this story over and over again, the children always seem to be surprised that it is a tiger at the front door! They also continue to be filled with amazement as the tiger polishes off all the food and drink in the house. It is such an imaginative story with fantastic illustrations, which capture the tiger’s mischievous antics. We recently made tiger masks and enjoyed acting out the story. Here Izzie is pouring tea for the tiger. I always thought the little girl's mummy had invented the story about the tiger’s visit to get out of making dinner for daddy. Personally, I think it is a trick we should all try at least once!